WHAT I SMELL: Opens with a bright and sweet tuberose which is very sunny and fresh. After a couple of minutes I detect light citrus with a bit of mint or maybe a slight incense. Whatever it is, it makes this more interesting in that its not just another sweet floral. After about 10 minutes, Datura Noir starts to even out and it becomes a bit creamy. There’s some meat to this beautiful flower as it seems to expand on the skin. After around 20 minutes I can detect a bit of apricot wrapped up in the flowered musk. The fragrance then becomes a bit deeper and richer in its complexity and as time goes on keeps growing in strength, with the almond making it’s appearance in almost a candied fashion which is probably because of a coconut note which adds an “Almond Joy” element to the fragrance. For an expansive period of time Datura Noir is a fragrance that does not know the meaning of shy. 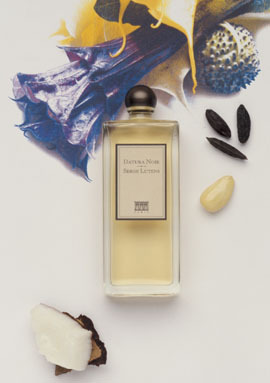 In the end though, Dratura Noir quiets down into a light musky tuberose that is comforting in a slightly sweet way. WHAT IT SMELLS LIKE TO ME: Floral happiness. da·tu·ra , dəˈt(y)o͝orə/ noun: a shrubby annual plant with large trumpet-shaped flowers, native to southern North America. Daturas contain toxic or narcotic alkaloids and are used as hallucinogens by some American Indian peoples. Given that, Datura Noir is neither hallucinogenic nor dark…but instead is a charming and intoxicating floral beauty which was a complete and pleasant surprise! Categories: Serge Lutens | Tags: 4 bones, Datura Noir, EDP, fragrance, review, Serge Lutens | Permalink. Oh boy this sounds like heaven in a bottle. And with Almond Joy! What a yummy review! It’s a beauty Lanier. But don’t get me wrong, it’s not so sweet, but just sweet enough. I wore it out today in the heat and I was afraid that it would bake and become suntan lotion and it did not. I think this is one of the more interesting vanillas that I own. Glad to see it getting some attention. FJ – It’s a vanilla for people who don’t want to smell like vanilla. I’m glad I gave this a try! Thanks for stopping by. Freddie – who would have thought tuberose on this guy??!! I was really surprised!!! It sounds lovely on you, darling. And significantly less schizophrenic than it was on me! 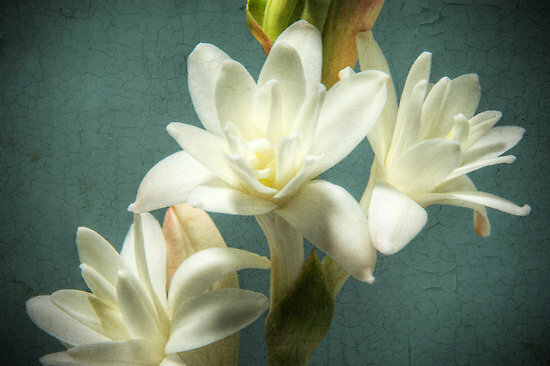 Yay for Lutens love, and even more so for a tuberose than works on your skin without horror! Just out of curiosity, what does the hubby think of the coconut in this one? Is it terrible that I’m starting to adore the hubby — whom I have never met or exchanged a single word with — as much as you??! Will you please tell him that he has a huge fan who shares his views on a number of things that you were. God, I feel like giving him a huge hug right now. This one isn’t for me. I think because of the tuberose. Kafka suggested that it was coconut. Whatever it was I don’t want it. But it’s great that it works for you. I like it, not love it. I won’t be running out for a bottle, but if I did have one it would be part of my rotation! I find Datura Noir more white. Datura flower has very strong somehow sweet dirty, rotten smell and it blooms only at night. I’ve been able to smell it myself so the perfume is not near this. I was given a blotter with this on by mistake – the SA said it was Fille de Berlin. I liked it instantly and remarked: ‘Ooh, it’s more floral and fruity than I was expecting.’ Serendipity, eh? I would happily seek out a sample of this now. Please do… I would love to hear your impression.